Why do we step in to the world of "Pet life"
I am the owner of two toy poodles. 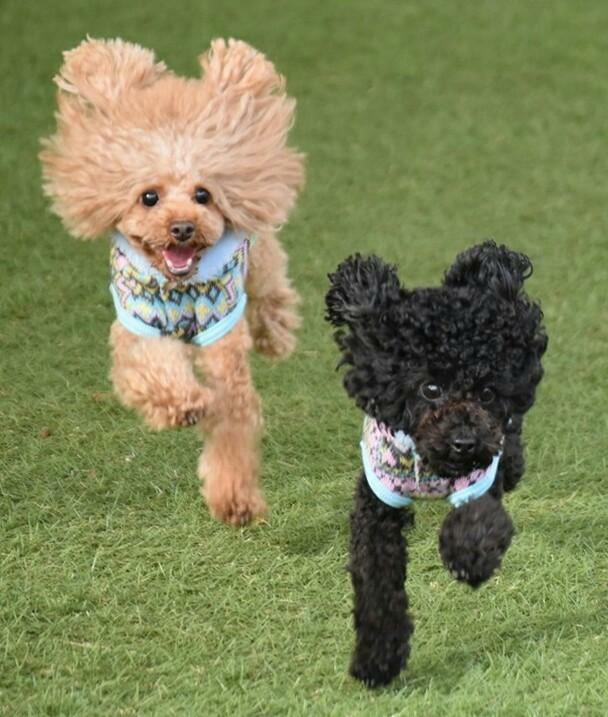 They keep me cheerful, and there is nothing more precious in this world than my poodles.When Hemhem, the older one, first came to my home, he was my first pet, and I had no idea how to look after him or how to train him. I was completely at a loss. Of course I could read books or look things up online, but whenever I saw him being naughty, I flew into a panic. I couldn't put into practice the advice that I had read, I couldn't train him properly, and my frustration got worse and worse.So I turned to a dog training school. The school I went to was run by a veterinary hospital. Their program was extremely thorough. Instead of just teaching the dogs how to sit or wait, a veterinarian also taught me how to maintain the dog's health. The veterinarian emphasized the importance of brushing the dog's teeth every day in order to maintain his/her health. They gave me full training in how to make my dog get used to having his teeth brushed, which really reassured me. Now I brush the teeth of my poodles every day before they sleep. So many pet owners I know say they didn't know they had to clean the teeth of their pets with a toothbrush and consequently don't do it. I found it very strange that they didn't know how important it is for maintaining the health of their beloved pets. Not everyone who starts to look after a pet goes to a training school. After all, anyone can become a pet owner, quite easily. To drive a car we have to have a proper knowledge of the rules of the road and how to drive the car, on top of which we need to pass a test. But there's no qualification required for owning a pet, so there are major differences in how people look after and discipline their pets, and their knowledge and way of maintaining their health. According to 2016 research by Anicom Insurance that I read after starting this project, 80% of all cats and dogs over 3 years old have gum disease. This is the number one cause of pets having to undergo hospitalization and surgery. Yet 62% of pet owners do not regularly brush the teeth of their pets. The reality is that many pet owners, though they love their pets, don't have the habit of looking after their pet's health. If their teeth are not brushed, pets will eventually suffer from gum disease. If the disease becomes worse, they may have to be hospitalized and undergo surgery with general anesthesia. I wanted to reduce the number of dogs and cats needing to suffer this painful surgery, and to decrease the number of pet owners regretting not learning about the importance of brushing their pet's teeth and adapting them to it sooner. So I decided that there should be a system (a community) to provide consultations and comprehensive information on products, support, and base knowledge for pets and pet owners to enjoy healthy lives. For the hundred years of its existence, Panasonic has supplied countless consumer electronics to the world, to help make your lives better. Lots of these products are essential to or highly beneficial for owners living with their pets: air conditioners, air purifiers, humidifiers, hair dryers, network cameras, digital cameras, and so many more. I want to give pet owners not just the chance to use these products but also the knowledge and support to show them how useful they can be for life with pets. Because Panasonic has housing and nursing care businesses as well as consumer electronics, I think it might be the only company able to provide a comprehensive solution for the best living space for pets and their owners. With this mission, we at Panasonic are going to declare far and wide its deeper involvement in the pet business. Last of all, I think that living with a pet that happily greets you with a wagging tail when you come home from work can play a vital role in maintaining your mental health. As I said at the start of this article, my two toy poodles are my biggest source of support. All the dog owners I know are highly cheerful and optimistic. Of course they have their tough times, but they're still positive! In our contemporary society where people suffering from emotional problems (like depression or suicidal thoughts) continue to increase, I think increasing the number of people living with pets might provide a natural way to heal or prevent such illnesses. "Let's create a positive and cheerful society where pets and their owners can enjoy their physical and emotional health." I believe that Panasonic can make a major contribution to the resolution of contemporary social problems by using its capabilities to achieve this goal. I hope that Panasonic will be essential to society in this way, and want to continue to work at such a company. That is my reason for wanting to build a pet business in Panasonic.